Wild Ale – The Barley Whine , here comes another proven winner, releasing yet another take on craft beer. Commercial description: Such a strong and ugly word, but unfortunately true. Our vintner friend just doesn’t appreciate the depth and character of the aromas and flavors that Brettanomyces creates like we do. Like you do. But the dude has some seriously fine Cabernet Sauvignon barrels that he shared with us to help create this wondrous sour ale. Our lucky #13 in this series. Aged for 12 months in Cabernet Sauvignon barrels. Pours a cloudy, ruddy orange with minimal tan head that dissipates quickly. Nose brings oak, huge lactic acid, raspberries, some funkynesss, and wine. Sparkling carbonation. Taste is quite sour, tart with raspberries, with potent acid, covered mostly with the fruit and funk. Not nearly as funky as the nose would indicate though. Like the bitterness of an IPA, sours will build up their primary flavor with each sip. 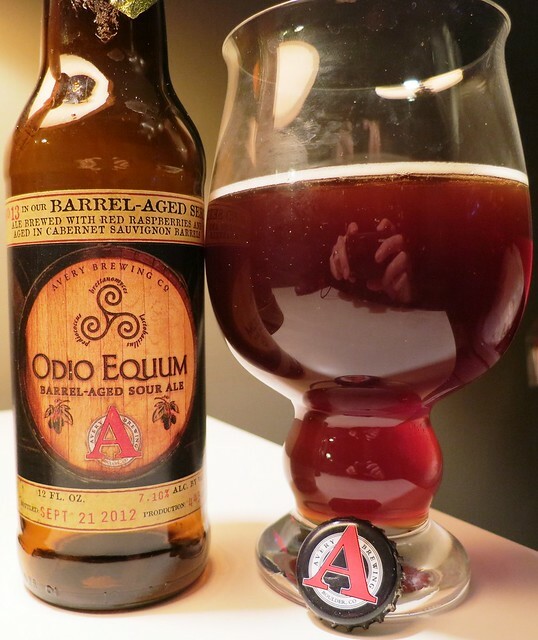 The Avery Barrel-aged Series #13 Odio Equum however, has enough sweetness to minimize this effect, making the drinkability quite high. Finish is tart and dry. Overall, the complexity is a bit less than expected, but this is a delicious beer. This is the first taste I’ve had of Avery’s barrel-aged series, and it has me excited to drink more of the Odio Equum and whatever comes next. The sour or wild ale is a style that can go wrong in a number of ways, and Avery has passed the hurdle of not making a drain pour. While not quite on par with Belgian lambics, or Russian River, Avery Odio Equum far exceeded expectations. Barrel aged #13 is truly a delicious beer that uses raspberries and the cabernet barrels to balance the sour notes. Seek out this delicious experiment from Avery. Hair of the Dog Brewing Company out of Portland Oregon makes some of the Pacific Northwest’s most delicious beers. Head brewer Alan Sprints brewed up one of those big beers, a massively flavorful American barleywine (they call it a golden strong ale) named Fred, and blended it with the guys at De Proef, who brought a number of Flanders based lambics to the mix. 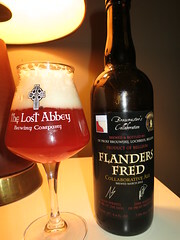 The result is known as De Proefbrouwerij Flanders Fred, the 6th in the ‘Brewmasters Collaboration Series’ from De Proef. Orange with a white, frothy top, Flanders Fred smells a bit malty and of apples. The tastes are multifold; very fruity, with sour apple dominating, balanced by a nice sweet finish. At first blush this tastes like it is going to overwhelm you with sourness, but the finish makes the overall flavors only gently sour, allowing all the fruit and Belgian yeast notes and some barnyard to come through. The hops are noticeable, but only as a bit player. The carbonation is just brisk enough to deal with the significant body. Finish is tart and sweet, with the green apple lingering on my tongue. A delight to drink. 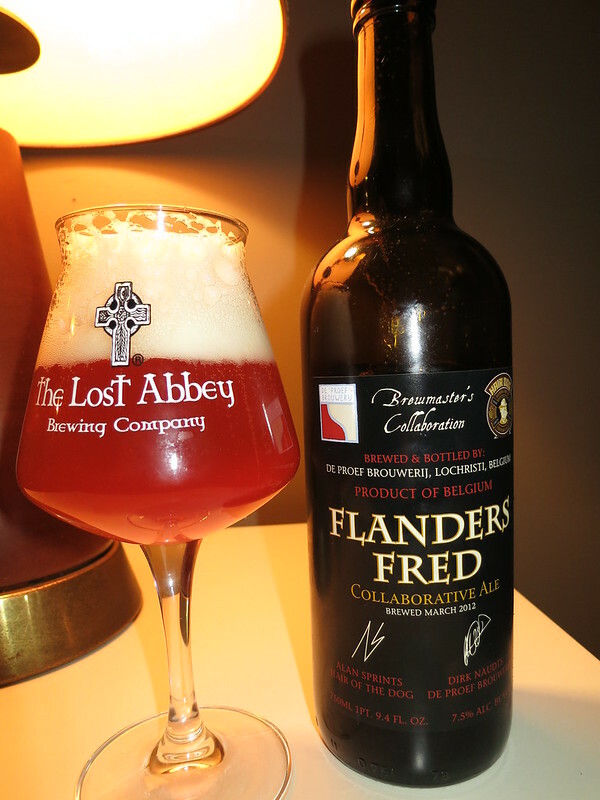 De Proefbrouwerij Flanders Fred is a delicious beer that even the sour beer novice will love. Collaboration beers rarely work for me. In this case however, the best elements of sour, fruity Flanders lambics, blended with an intensely flavorful barleywine, make something even better than the sum of its parts. Both brewmasters distinctive styles are clearly on display in this refreshing, exquisite brew. As the sixth in De Proef’s ‘Brewmaster’s Collaboration Series’, having previously paired up with brewmasters at Lost Abbey, Allagash, and Terrapin, I can’t help but feel I’ve missed some other amazing projects. I am such a fan of this beer I plan to seek out next years Collaberation Series beer, as well as anything else Dirk Naudts at De Proef is bottling. You should too.